Nearly from its beginning, Batavia was an industrial city. Farm implement and windmill factories provided employment for many. The first products manufactured in Batavia (flour, ice, lumber, paper, stone) found markets in Chicago. Batavia’s significant industries are identified with the following Categories. Click any category from the menu above for the history and involvement of companies from Batavia. 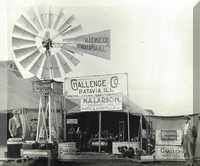 Batavia had developed well known and successful Farm Equipment manufacturing businesses. The Newton Wagon Company, which began in 1854, was the first large factory to take advantage of the area’s natural resources. Three major windmill factories, the Appleton, the Challenge, and the U. S. Wind Engine and Pump Co., were so productive that by 1890, Batavia was recognized as the leading windmill manufacturing city in the world. The output of these companies served an important role in settling the West. The Batavia Depot Museum is a joint venture between the Batavia Park District and the Batavia Historical Society.